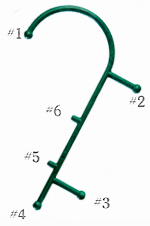 Loop R arm inside #3 ball shaft, push R arm forward to apply pressure and/or move arms side to side. Hold at #6 ball and push up to apply a slight pressure and then move arms back and forth from head to toes. Lean T.C. 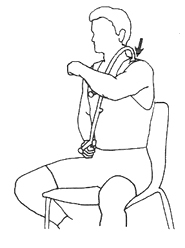 against a firm back chair, push L arm forward to apply pressure and then move upper-torso side to side. 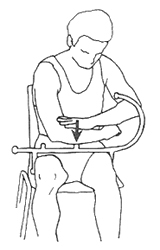 forward at the elbow for pressure, keep L hand and arm still. Push #1 ball up and into the muscle with the L hand, arch back slightly for added pressure. Lean T.C. 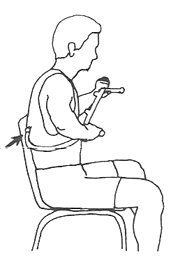 against a firm back chair, push R hand forward to apply pressure and then move upper-torso side to side. Position hands as shown and place #3 ball on neck, push downward on #2 ball shaft to apply pressure, then move neck slowly across the ball. Position hands as shown and place #5 ball on neck, push downward with L hand to apply pressure, then move neck slowly across the ball. 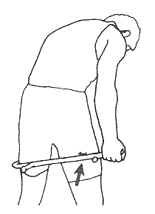 Push downward with L hand and move ball slowly back and forth across the shoulder. 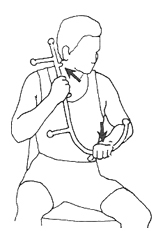 Place R hand at top of hook portion of cane, place on shoulder and press downward to apply pressure. 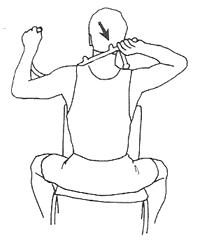 Place #5 ball on back of neck and lean head back into the ball to apply pressure. 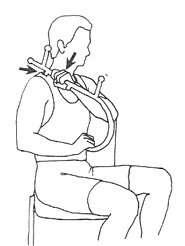 Place #1 ball on shoulders and place L forearm on #2 ball shaft to apply pressure. Each ball has been assigned a number 1 to 6. 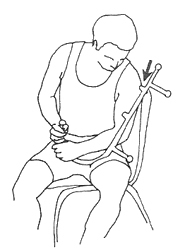 Beneath each illustration lists the area being massaged and the ball used. 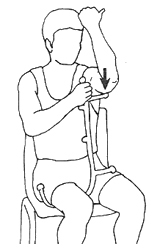 Switch hand position from those shown in illustrations when massaging the opposite extremity or side of the body. Position T.C. 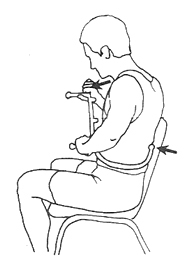 over legs as high up on lap as possible and place forearm on #6 ball, place L hand on top of forearm for added pressure. Loop T.C. under leg and up close to chest, place L arm on ball and lean weight into #3 ball to apply pressure. Loop the hook portion of the T.C. 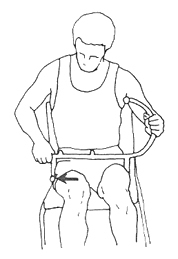 around L leg and push forward with R hand to apply pressure on R leg. Loop the T.C. 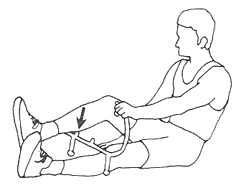 around L leg as shown and push downward with R hand to apply pressure on R leg. Position T.C. as shown and rest calf on #5 ball to apply pressure, sit back against wall or lean R arm back for support. Position T.C. 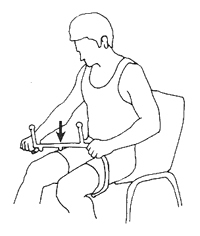 across the lap as shown, keep L arm still and move R hand back and forth to apply pressure, switch T.C. for opposite leg. Position T.C. 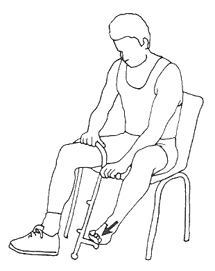 as shown for stability and press downward with L foot to apply pressure. Loop the back portion of the T.C. 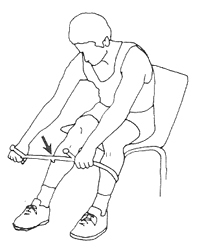 across the legs and press downward with R hand to apply pressure.